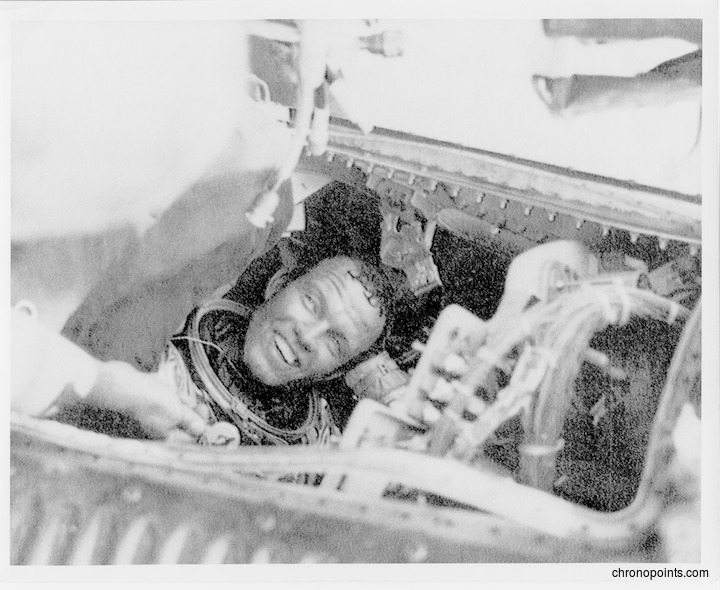 Gordon Cooper (1927-2004) completed his 22.5 orbit flight in the Faith 7 Mercury spacecraft by manually landing in the Pacific Ocean on May 16, 1963, closer than any other flight had landed with reference to the recovery ship. A dehydrated Cooper, still in Faith 7, is seen after the recovery aboard the aircraft carrier USS Kearsarge. Cooper not only set a record of staying in space for over 34 hours, but he would prove a trained pilot was an important ingredient in space flight. Original black and white photographic print, May 16, 1963: Private Collection of Dr. Calvin D. Fowler. Digital reproduction of original black and white photographic print, May 16, 1963. "Faith 7 for 22 Orbits". National Aeronautics and Space Administration. http://history.nasa.gov/SP-4201/ch14-6.htm. 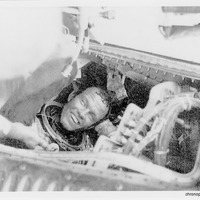 “Astronaut Gordon Cooper Recovered After Splashdown.” RICHES of Central Florida accessed April 21, 2019, https://richesmi.cah.ucf.edu/omeka/items/show/5012.